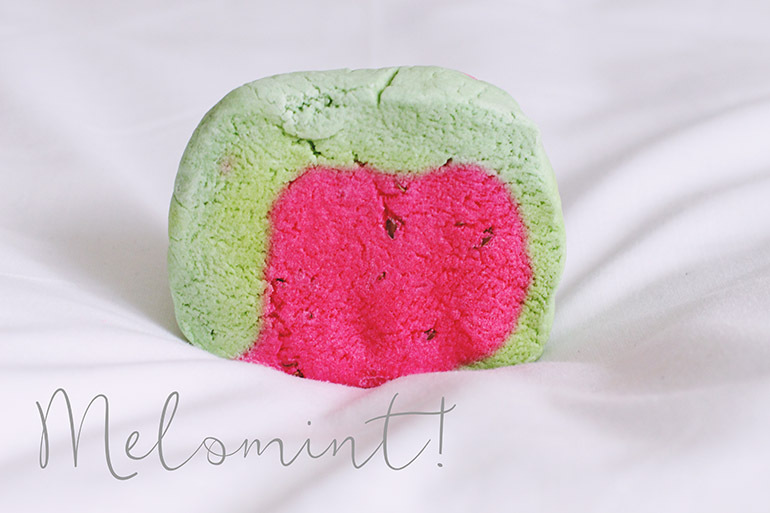 As you can see, the bubble bar is formed in the shape of a watermelon slice with a bright pink centre, mint green rind and even little pips in the middle. This, compared with the name, led me to believe that the fragrance would be a combination of watermelon and mint. Not an unreasonable assumption, right? Well, I was wrong. There's no melon ingredients at all. Instead, it's a combination of spearmint, peppermint and cypress oils, giving a really fresh, minty fragrance. I've had the bubble bar sitting in my living room for a while and the scent is so strong, it's unreal. It's been filling the whole room! With this in mind, you can imagine how surprised I was to find the fragrance was much less pronounced once it was in the bath and was altogether a very forgettable scent. I used half a bar for one bath and I could probably have got away with a third. It produced a lot of bubbles, and it was interesting to note that they had a strange consistency. They weren't as light and fluffy as Lush's usual products. Instead, they were a bit more soapy. I did notice that the water felt moisturising though, so there's that. Be warned when you get out: The pips (which I think are real watermelon pips) stick to your skin and look like bugs. Almost gave me a heart attack when I saw one on my arm! After waiting so long, was Melomint worth the anticipation? Unfortunately, no. Not even a little bit. Still, at least I've now tried it and can stop wondering what it's like. Even though you've found it quite disappointing Becky and with the fact you got the pips on your skin, I'm still intrigued to try this out for some reason? Especially the smell of it...That's really unusual! Never even heard of this bubble bar until now! Thanks for doing a review on it! Ah it's a shame it didn't live up to expectations, it is a cute lil thing though and sometimes we just have to try things to know! Hate it when post-bath bits stick to you though - I always want to get out cleaner than when I went in!